Could you or your family have Text Neck? Chances are you’re reading this while leaning over a table or slumped back in a chair. Your head is tilted forward and your shoulders are curved. If you’re on a mobile device, your arms are bent by your side and your back hunch is even more profound. Am I right? The position you’re in is probably causing you pain, whether you’re aware of it yet or not. It can affect your breathing, heart rate and blood pressure and down the road it can cause degenerative disc disease. Don’t worry, there is a diagnosis for the headaches, neck cricks and achy shoulders. They call it Text Neck or Tech Neck. 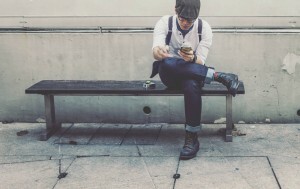 The way we text and use technology is having a negative effect on our health – it is a global epidemic that is literally changing the way our bodies should grow. Staring down at your phone or other wifi device can put incredible pressure on your neck and spine. 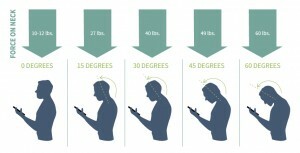 A 60-degree angle – the angle at which most of us view our phones – increases that stress to 60 pounds. That’s like carrying around a seven year old on your neck! Recently a lady booked an appointment with me for her child, she was suffering from headaches and neck pain. I noted her posture as she sat in the waiting area. She was sitting in a chair, hunched over her smartphone, texting away. And it struck me… we are all spending way too much time sitting like this every day. We are all guilty of it, and we may not even realise we are doing it! Staying in what experts call the “forward head posture” can lead to muscle strain, disc herniations and pinched nerves. Over time, it will cause you problems! I started seeing patients with head, neck and back pain caused by mobile devices six or seven years ago. However recently I have seen Text Neck has increased dramatically, especially among my younger patients. So what’s an iPad-cradling, smartphone-texting, laptop-loving person to do? Banning them is certainly not the answer. The issue is the amount of time that children (and ourselves) spend on them and their posture while using them. First, be aware of your body. Keep your feet flat on the floor, roll your shoulders back and keep your ears directly over them so your head isn’t tilted forward. The most important tip is to take frequent breaks while using any mobile device or desktop computer. About every 20 minutes, stand up, roll your shoulders and neck or go for a short walk to improve blood flow. A good way for children to counter text neck and neck and spine pain is by lying on their front and propping themselves up on their elbows. If you are concerned about a family members’ posture or think you’re suffering from Text Neck, why not give me (Dr Ben) a call on 021 487 8465 (Optimal Chiropractic Ballincollig). The type of Chiropractic treatment I offer is very gentle. It is natural and non invasive and very popular with parents with a desire to avoid giving themselves or their children pain medication, which have been proven to be detrimental to the liver, digestive system, and kidneys.